My wife and I like to travel during the holidays. This year’s trip started early Wednesday morning, and it would take us further away than usual. Going to far away places used to be such a chore. Not so much anymore. During my flight, I had about thirty movies to choose from to help pass the time. There were some I had meant to see at the theater and missed. Luckily, I had time to see a few before they made me get off the plane. “Won’t You Be My Neighbor?” was an option. It’s a film detailing the life and career of Fred Rogers of “Mister Rogers’ Neighborhood” fame. Honestly, there is not an emoji available to express the mammoth-sized yawn this might provoke. It’s a documentary of a “celebrity” from my youth, who I already remembered as the king of boring. But the critics raved about it. Friends, whose tastes routinely match mine, told me stories of entire theaters weeping in the dark at the film. Watching it almost felt like accepting the sinister triple-dog-dare from “A Christmas Story.” So, of course I did it. I watched it on a plane by myself. No popcorn. No one was with me to nod in approval to the memories of all of his characters and their subtle, yet profound messages. It was just me viewing a walk down memory lane. In all honesty, I don’t recall giving him much thought as a child. Or did I? Over 900 episodes of the show were broadcast. His first one was recorded in 1967, the year I was born, and I was watching his shows on TV at what I thought was the height of his popularity. I have since found out he was far more popular, and for far longer than I knew. But he was more than popular. He was important. He still is. The lessons he taught in more than thirty years of television are priceless. They were all founded in love, especially love of children, followed by the principle that all children should be loved just the way they are. Rogers has been blamed for creating the sentiment today of participation trophies and an erosion of the value of achievement. That is complete nonsense. He created “The Land of Make Believe” on his show which featured a cast of puppets that most American men my age remember. What I didn’t distinctly recall was the depth of the subjects that were discussed there. The movie shocked me by replaying a discussion of what the word “assassination” means, which aired shortly after the murder of Bobby Kennedy in 1968. The regular character of Officer Clemmons, a black police officer, might go unnoticed today. But it was far from a trivial item fifty years ago. Rogers did that on purpose. Officer Clemmons was played by Francois Clemmons, a gay man, which was another important topic the movie expertly recounts. 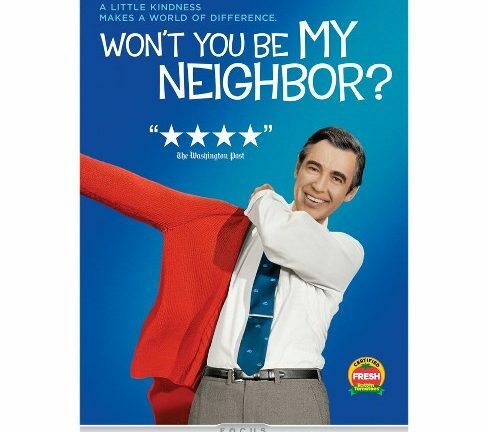 “Won’t You Be My Neighbor” would have been a good movie at any time, but I’m sure the reason it struck me is because of how badly we need it, and Fred Rogers, today. I found myself translating his messages to children in the 70’s into discussions that many adults really need to hear in the 2010’s. He was an ordained Presbyterian minister. He was from Pittsburgh. Pittsburgh? Not exactly the flower-child love-capitol of the era. He was a lifelong Republican, though he may have single handedly preserved the federal budget for public broadcasting contrary to President Nixon’s agenda. He said great things. I recall him giving commencement speeches and I once made fun of that. What could this boring minister from PBS have to say to new college graduates? Try it. Rogers was noted for how he embraced silence. Silence is an exercise Americans need plenty more of today. Another classic quote: “Peace means far more than the opposite of war.” It’s as if he meant the existence of true peace could eliminate the possibility of war. Yes, that is correct. “Who we are in the present includes who we were in the past.” The chaos of today will make us better tomorrow. We need Rogers’ lessons from his timeless and guiding handbook on life now more than ever. I’m thankful we still have it.